4.1 Napoleon Bonaparte's "Grand Sanhedrin"
The Hasmonean court in the Land of Israel, presided over by Alexander Jannaeus, king of Judea until 76 BCE, followed by his wife, was called Synhedrion or Sanhedrin. The exact nature of this early Sanhedrin is not clear. It may have been a body of sages or priests, or a political, legislative and judicial institution. 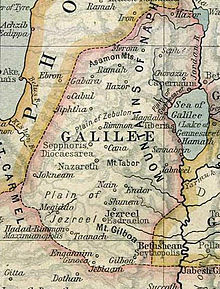 The first historical record of the body was during the administration of Aulus Gabinius, who, according to Josephus, organized five synedra in 57 BCE as Roman administration was not concerned with religious affairs unless sedition was suspected. Only after the destruction of the Second Temple was the Sanhedrin made up only of sages. ^ a b One or more of the preceding sentences incorporates text from a publication now in the public domain: Chisholm, Hugh, ed. (1911). "Jews" . Encyclopædia Britannica (11th ed.). Cambridge University Press. p. 403.